(Nanowerk News) The integrity of large structures like bridges, high-rise buildings, wind turbines, and large aircrafts is deeply related with security. Nowadays, due to the aging of large structures and the potential concerns about their collapse, interest in structural health monitoring has risen all over the world. Though there has been a great deal of research on the inspection of inaccessible large structures using mobile robots, since most existing robots require the installation of additional infrastructure or use magnetic-based technology or vacuum adhesion, it is difficult to apply those technologies to structures with diverse surface shapes and materials. 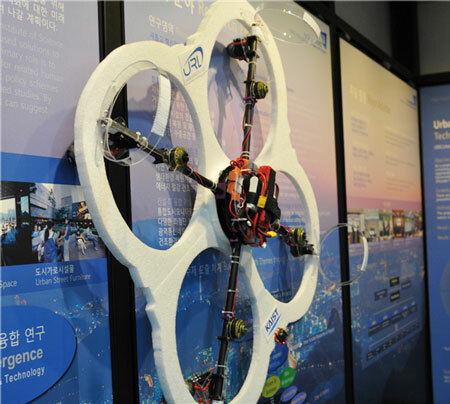 Professor Hyun Myung in the Department of Civil and Environmental Engineering at Korea Advanced Institute of Science and Technology (KAIST) has developed CAROS (Climbing Aerial RObot System), which does not require installation of any additional infrastructure and which features maximized mobility and safety as a wall-climbing robot. This robot has higher mobility than existing wall-climbing robots because it can fly. It also has an advantage in that it can restore its pose after an accidental fall due to an unexpected disturbance. Since the robot can stick to the surface, it can perform close inspection and maintenance of the structure. Firstly, the CAROS team designed and analyzed the structure/mechanism of the drone to maximize the flight stability and grip force on walls. 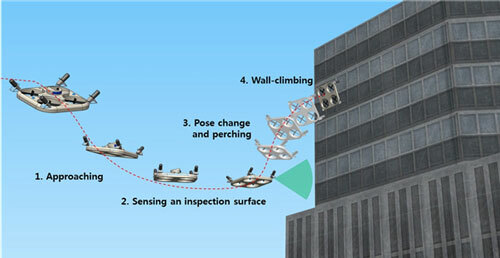 Secondly, they developed the algorithms of flying/climbing mode transformation and wall-climbing control, respectively. These algorithms enable the CAROS to change its mode when it meets a wall while flying. To make these algorithms, the forward and backward kinematics are derived and applied to the system. Lastly, the team developed an autonomous navigation algorithm using sensory information to recognize 3D environments. This technology also can be used to assess the situation in a fire disaster. Previously, a mobile robot equipped with a water hose and throwing-type mobile robots were developed to extinguish the fire, but it had a disadvantage when entering and moving through narrow spaces. The CAROS technology can be used as a surveillance robot for use in fires or disasters, as it can pass through narrow indoor environments by changing its mode from wall climbing to flying, and vice-versa, depending on the situation. If CAROS is equipped with a thermal camera, it can detect and track humans through thermal images. In addition, it can transmit environment information by wireless communication. Currently, FAROS (Fireproof Aerial RObot System) is being developed based on the CAROS that can both fly and climb the vertical wall to overcome narrow or destroyed spaces caused by fire. The robot body is covered with aramid fiber to protect its electric components and mechanical parts from the direct effects of the flame. Under the aramid fiber-based armor, there are buffer air layers and a Peltier element-based cooling system that help to maintain the air layer within a specific temperature range. For autonomous navigation, the FAROS estimates its pose by utilizing a 2D laser scanner and an IMU (Inertia Measurement Unit) sensor installed in FAROS. With the localization result and a thermal imaging camera installed on FAROS, the robot can also detect and localize the ignition point by dedicated image processing technology. These technologies are expected to be applied to the inspection or maintenance of structures and objects in remote or inaccessible regions. Such technologies can also be applied to various types of maintenance of urban structures such as inspection of wind turbine blades and cleaning of high-rise buildings and solar panels. Professor Myung said, ?As cities become more crowded with skyscrapers and super structures, fire incidents in these high-rise buildings are massive life-threatening disasters. FAROS can be aptly deployed to the disaster site at an early stage of such incidents to minimize the damage and maximize the safety and efficiency of rescue mission.? Due to its novelty and potentiality, CAROS and FAROS have received media attention internationally, and the team has applied for related patents. This research was presented at the Int?l Conf. on Control, Automation and Systems (ICCAS) 2015 held in Busan, Korea, where the research team was awarded the Best Presentation Award.